Escapes, retreats, hideaways and dens; treehouses have always been a place of refuge. Literary works like Enid Blyton’s The Faraway Tree, Wyss’s The Swiss Family Robinson and family favourite Hook have firmly established treehouses in the imaginations of children through the ages. As the film Hook reminds us, that urge to take flight from the grown-up world, hide out in a treehouse and be carefree again often follows us into our adult life. Which is exactly why we love building treehouses for big kids too! At Blue Forest we know better than most that scrambling up trees, camping out in dens and daydreaming don’t have to be fond childhood memories – they can be grownup options. The treehouses we have designed and built have provided countless clients with treehouse getaways that are storybook perfect – whether they’re modern reinventions or a sentimental nod to a bygone era, each one has offered a chance to escape the daily grind and satisfy our eternal inner-child. 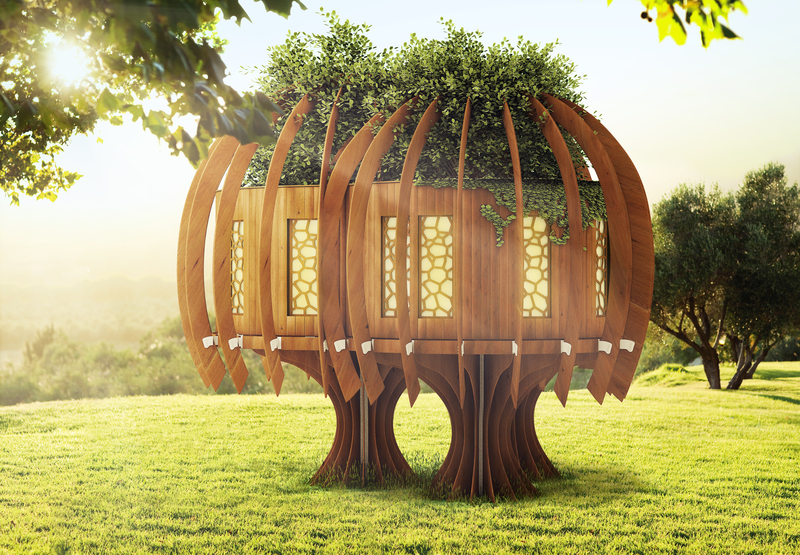 We all know that the ideal hideaway treehouse would be located in a peaceful wood, set against a soundscape of chirping birds and the rustling of light breezes through the trees, but what if you needed a retreat from the loud and bustling modern world? Working with Quiet Mark, Blue Forest created a soundproofed treehouse that offers a true sensory escape from the surrounding area. The “Quiet Treehouse” was featured at the Ideal Home show which was a fantastic way to promote the concept of living a quieter life. For many artists and musicians it can be hard to find a space where they can work free from distractions.. Blue Forest were asked to design a contemporary and functional music studio which would providing a private, noise-controlled space where the artist could develop their creativity and focus on composing great music. The Music Studio is soundproofed so that the musician has solace and privacy from the outside world. A woodland hideaway can also offer the perfect environment for an artist or writer’s studio. They provide solitude and focus and because they are an adaptable space, can be designed to very specific needs. Need a whole wall of made of cork board for plotting that novel? Must have light streaming in through the window? A treehouse might not be your first choice, but it really should be. In the real world, the days of a secret knock or complicated password may be at an end, overtaken by keycodes and retina scanners. Modern treehouse dens don’t have to be left behind either. One high-tech hideout we’ve designed, inspired by gadget-centric films such as James Bond or even Spy Kids, includes a biometric security system composed of fingerprint scanners and a night vision enabled CCTV system. Secret agent fantasies come true with top of the range equipment, allowing your hideaway to remain hidden and shut tight from unwanted intruders while you sit back and relax in a state-of-the-art entertainment den that 007 would be proud of. Part of the infinite magic of treehouses is that they can transport us miles from our reality by simply climbing up a ladder to a tree in our back yard. 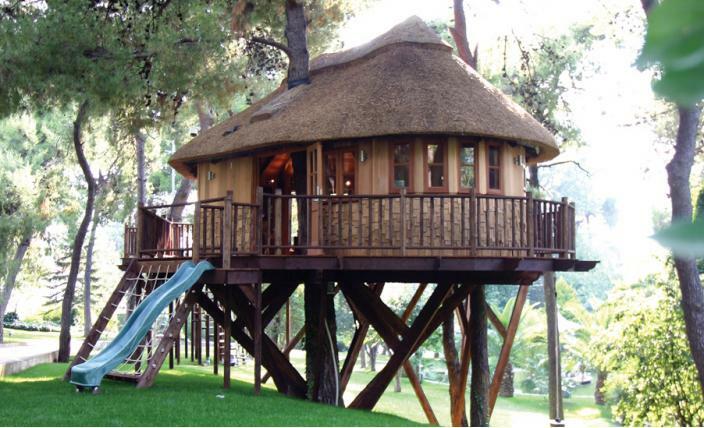 But if it is real travel you are after, there are treehouse escapes in exotic locations that offer escape unlike most. Imagine a lavish and secluded treehouse buried deep in the forests of Borneo. Blue Forest were given the remit of building a luxurious rainforest retreat as a private oasis for wealthy guests. A form of sustainable, low-impact tourism, the site is in barely explored forest, requiring a helicopter ride to reach. Whether you’re looking for a real getaway or just to take flight temporarily, it’s very likely you’ll find the escape you need up a tree. A treehouse can also offer a space for healing and recovery. 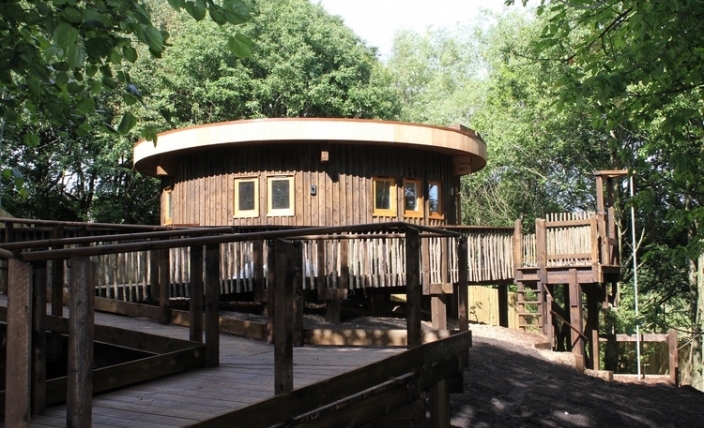 The Woodland Retreat we built for the NHS is designed for vulnerable young members of society with mental health difficulties to use as a sanctuary while they recover. Away from the pressures of school and family, teenagers use this special NHS mental health unit to refocus and reconnect with nature in a calm and peaceful surroundings. The first of its kind in the UK, this treehouse is proof of the powerful impact a thoughtful building can have. Treehouses can bring out the inner-child in adults, but it’s also important that they provide a secure and safe space for children to just be children.